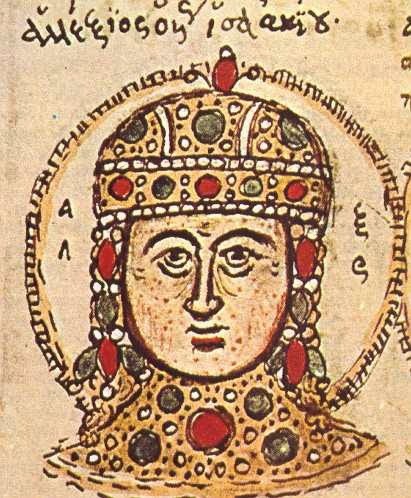 Emperor Alexios III Angelos (c.1153-1211) overthrew his brother, Emperor Isaac II Angelos (1156-1204) in 1195; not your usual way to achieve the throne, but since Isaac had taxed his people heavily in order to start a war with Bulgaria that turned out to be a waste of resources, the army was glad to call Alexios "Emperor." Isaac was blinded and imprisoned in Constantinople. His son, Alexios IV Angelos, was also imprisoned. In 1201, Alexios IV was smuggled out and taken to Germany, where his brother-in-law, Philip of Swabia, was king (Philip had married Irene Angelina, daughter of Isaac II). While in Germany, he met Boniface of Montferrat. Boniface had been elected leader of the 4th Crusade. Of course, the financial troubles of the Crusade meant that they were indebted to Venice, whose Doge Enrico Dandolo had been made leader. In the winter of 1202-3, while the Crusading army was staying in Zara, Boniface went to visit Philip of Swabia, who was his cousin. Alexios poured out his story of betrayal and exile, and made Boniface an offer: bring the Crusade through Constantinople, use its might to depose the usurper, and Alexios would promise him 10,000 soldiers, 500 knights to hold the Holy Land once the Crusade was successful, and enough money to pay off the debt to Venice and get out from under their control. Boniface might have been more wary of deals that seemed too good to be true, but Alexios threw in something that a Western Christian could not resist: he would make the Eastern Orthodox Church answerable to the Pope in Rome. Boniface was thrilled, and took the offer, along with Alexios, back to Zara to present him to the army. The army went for it, as did Dandolo. Remember that Venice was due 50% of any "spoils of war"; a potential war with Constantinople could produce a lot of spoils. Come Easter, the army set off, not for the Holy Land, but for Constantinople. There was a great deal of disagreement over this among the Crusaders—Simon de Montfort was one voice in opposition—although it was finally ratified. There were two major objections against it: 1) it was a distraction from the crucial major goal, and 2) Zara was a Christian city; to attack it when your purpose was to fight heretics was outrageous! The Doge then increased the stakes. At a Mass at St. Mark with Venetians and Crusaders present, Enrico Dandolo (who was at least in his 80s, and blind) swore to join them and take up the Cross if they consented to let him be their leader. The Crusaders accepted gladly, and more Venetians joined the Crusade. The Crusading force sailed to Zara, and set up a siege. Certain leaders of Zara came to the Doge and said they would hand over the city if their lives were spared. 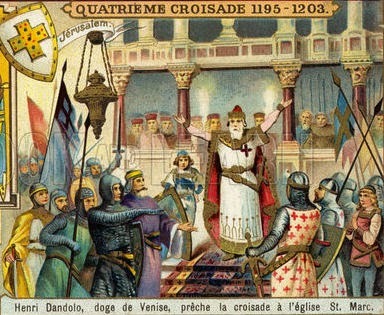 Dandolo said he would discuss these terms with the rest of the Crusade; while he did, Villehardouin tells us that the Crusading faction that was opposed to fighting Christians told the Zarans that the Crusade would never attack a Christian city, and they could resist in safety. Also, the Abbot of Vaux (a Crusader) forbade the army from attacking Zara. But attack they did. Dandolo was enraged that he had a deal with Zara that was foiled by others. The siege brought up mangonels and other weapons. They pelted the walls and towers with stones for five days, and had sappers start on one wall and a tower. * This was enough to motivate Zara to surrender. By this time winter was approaching, and the Doge decided they should stay in Zara until spring. There were troubles in Zara, between the different nationalities, but that is not part of our narrative. What must be mentioned is that Pope Innocent III excommunicated the Crusaders for attacking a Christian city. *Sappers would dig under a structure to cause it to collapse; sometimes they employed explosives. The Kingdom of Jerusalem, established after the First Crusade by Europeans, had been re-conquered by Saladin in 1187. Much of that was reclaimed by the Third Crusade (1189-1192), but Jerusalem itself eluded recapture. This was a problem for Europeans. In 1198, Pope Innocent III began his papacy with the preaching of a new crusade. At first, no one was rushing to join. England and France were busy fighting each other, Germany was opposed to recent papal overreach, and it was only a few years since the last Crusade—people were tired, and Crusades took energy and money. Innocent had an ally in the charismatic Fulk of Neuilly (about whom we know almost nothing outside of this sentence), who preached the Crusade and drew several to it, including Simon de Montfort, 5th Earl of Leicester. "We will build transports to carry 4500 horses, and 9000 squires, and ships for 4500 knights, and 20,000 sergeants of foot. And we will agree also to purvey food for these horses and people during nine months. This is what we undertake to do at the least, on condition that you pay us for each horse four marks, and for each man two marks. "And the covenants we are now explaining to you, we undertake to keep, wheresoever we may be, for a year, reckoning from the day on which we sail from the port of Venice in the service of God and of Christendom. Now the sum total of the expenses above named amounts to 85,000 marks. The envoys agreed to these terms, and returned to France to inform the leaders of the Crusade of their success. The army was gathered and a start date was set for the following year. According to Geoffrey, a large number of Crusaders went, not to Venice, but to the port of Marseille, or Genoa, or other ports. (To be honest: Marseille makes sense if you're starting out in France; why have to cross the Alps and go to Venice?) Perhaps the envoys should have haggled for a lower price for transports; after all, Venice was going to get half of any spoils of war. Whatever the case, when the Crusaders arrived in Venice, there were not as many as advertised, and they could only gather 35,000 marks, a far cry from the 85,000 of the contract. They had been assembled on the island of St. Nicholas to avoid the overcrowding and potential problems of having thousands of strangers on the streets of Venice, but this effectively made them captives of Venice. 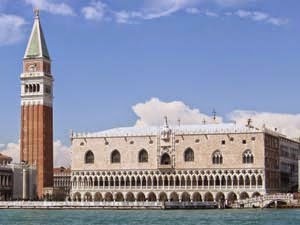 Venice did not want to cancel the contract: they would lose all the money they had invested, and Venice' reputation might suffer. They had to come up with a solution that allowed the Crusaders to continue on their journey and that was financially satisfactory for Venice. Simon de Montfort has been mentioned before, opposing Henry III, but that was the 6th Earl of Leicester. The Simon de Montfort we want to talk about today was his father, the 5th Earl. 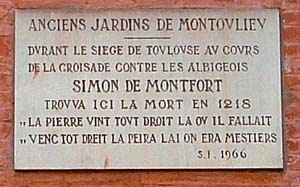 Simon was born in 1160, succeeding his father as Baron de Montfort in 1181. In 1199, while taking part in a tournament, he heard Fulk of Neuilly preaching the 4th Crusade and decided to "take up the Cross" along with his brother, Guy (who had been on the 3rd Crusade already), and Count Theobald de Champagne. Then there befell an adventure which weighed heavily upon the host; for one of the great barons of the host, by name Simon of Montfort, had made private covenant with the King of Hungary, who was at enmity with those of the host, and went to him, abandoning the host. With him went Guy of Montfort his brother, [...], and the abbot of Vaux, who was a monk of the order of the Cistercians, and many others. And not long after another great lord of the host, called Enguerrand of Boves, joined the King of Hungary, together with Hugh, Enguerrand's brother, and such of the other people of their country as they could lead away. Montfort was a supporter of the new Dominican order, having known its founder Dominic Guzman, and a devout Christian. After returning to Europe, Montfort was instrumental in the Albigensian Crusade in 1209, a war against the Cathars. (The Cathars were considered heretics for some of their unorthodox ideas.) He was a good tactician and a ruthless leader, willing to carry out orders from the Church no matter how harsh, such as when in 1210 he had 140 Cathars burned alive at Château de Minerve, a Cathar stronghold. For his efforts, King Philip Augustus granted him the lands of Raymond of Toulouse, who was in Aragon. The difficulty was that Toulouse did not want to be handed over to someone else, so Montfort needed to besiege Toulouse in order to take control. After nine months of siege, Montfort was killed by a rock to the head thrown by a type of catapult called a mangonel. He died on 25 June 1218, 796 years ago today. *We will look at the 4th Crusade a little more tomorrow. This past Saturday, the 21st of June, was the anniversary of the death of Enrico Dandolo, the 42nd Doge of Venice. His tenure as Doge had great significance for Venice, and had disastrous consequences for Constantinople. Born about 1107, he had a successful career as a diplomat who came to true prominence in 1171 when Constantinople imprisoned all Venetians and confiscated their property. The Doge at the time, Doge Vitale II Michiel, gathered a force to attack Constantinople, but the plan failed when plague in 1172 killed many in the expedition. Michiel was killed on his return to Venice by the angry citizenry, but the returning Enrico Dandolo was made ambassador to Constantinople. A treaty was finally brokered in 1186, but the enmity between Venice and Constantinople remained, as we shall see. In 1192, Dandolo became the 42nd Doge. By this time, he was in his 80s* and blind—one contemporary chronicler (Geoffrey de Villehardouin) claimed it was due to a head wound—but his cleverness made him the popular choice, and his actions over the next decade justified it. He reformed Venetian currency, creating new coins of different denominations. One coin, the grosso, was consistently minted with 98.5% pure silver, making it a reliable standard for trade in the Mediterranean and increasing the economic prestige of Venice. His biggest impact on history, however, came during the 4th Crusade. 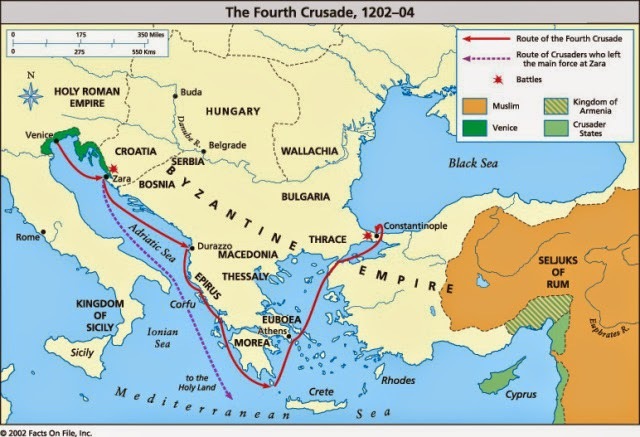 In the next few posts we will take a look at the 4th Crusade and why it went horribly wrong. *This is an assumption; one scholar believes he has clear evidence for 1107 as the year of Dandolo's birth, but the level of activity he showed after becoming Doge prompts some to think he must have been a younger man. 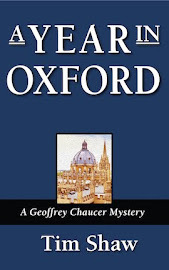 The title is based on the Latin dux ["military leader"], from which the word "duke" comes. The Doge was not a hereditary position, but was elected for life (unless circumstances led to being forcibly ejected from the position), usually from the pool of very smart elders. Pietro IV Candiano (959-976), who gave himself special privileges and powers with the support of Otto I, but lost that protection after Otto died, and found himself locked in his palace by the citizens of Venice, who then set fire to it. Pietro II Orseolo (991-1009), who expanded Venice's influence eastward, freeing Venice from 50 years of taxation imposed by the Narentines on the east coast of the Adriatic Sea; he married the niece of Pietro IV Orseolo, Maria Candino, who became his dogaressa. There were 120 Doges in all, the final one being Ludovico Manin (1789-1797), who was forced out of the role (never to be replaced) by Napoleon. But the shrewdest old Doge of them all may have been the 42nd, Enrico Dandolo, who took over a Crusade and used at as a weapon for his own purposes. That's a story for tomorrow. 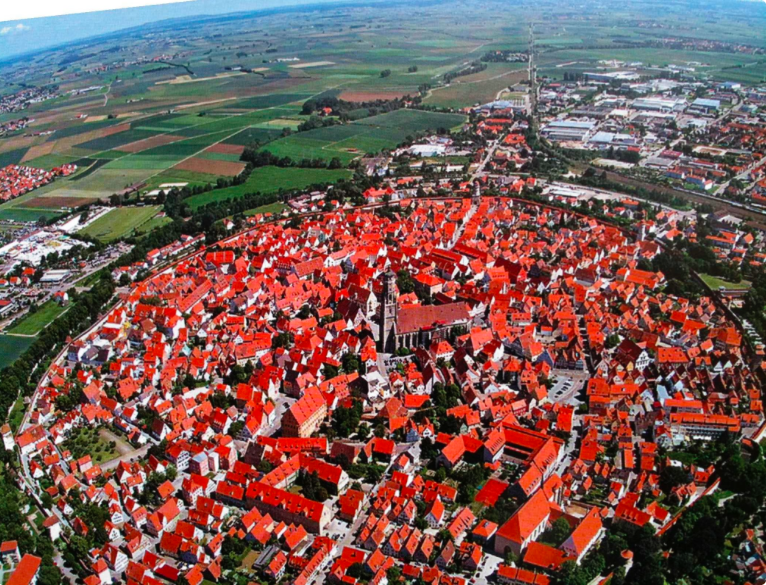 To wrap up a week of religion and mysticism, we turn to Margareta Ebner, a German nun who was born to a wealthy family at Donauwörth in 1291 and entered the Dominican Monastery of Mary Medingen near Dillingen. In 1312 she became terribly ill, and her health was extremely poor for the next decade. For the rest of her life, she spent a great deal of time sporadically bedridden. As was the case with Christina Ebner (no known relation), the illness led her to a more intense devoutness. She abstained from wine and fruit and even bathing in order to satisfy her desire for penance. She had to abandon the convent and return home when the Great Papal Schism caused war between different factions of Europe. The convent was loyal to the pope in Rome, and when Holy Roman Emperor Louis IV chose to support the pope in Avignon, Margareta left Dillingen and returned to her family. While there, the death of her nurse upset her greatly. She became unfocused, until Henry of Nördlingen in 1332 contacted her and started to guide her. His correspondence with her has been preserved, the earliest known set of personal letters in the German language. Henry sent her a copy of the works of Mechthild of Magdeburg. He also urged her to start writing down visions and revelations that she experienced. These included dialogues with the Baby Jesus. Her Revelations are in a manuscript in Medingen, at the Monastery that also houses her tomb. She died on 20 June 1351. 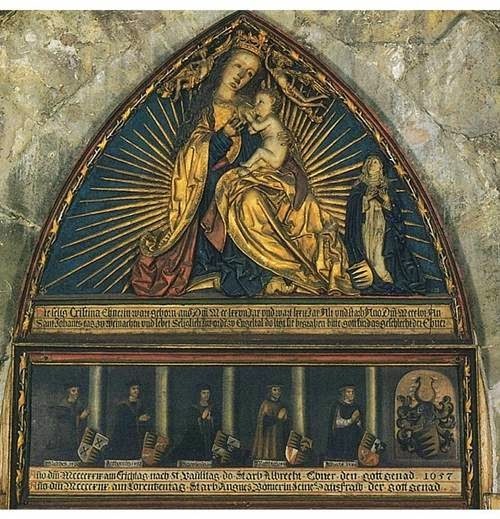 Mechthild (Matilda) of Magdeburg has been mentioned a couple times this week as an exemplar of mysticism whose story was translated and shared by Henry of Nördlingen with other mystics. She was born about 1210 in Saxony. At the age of 12, the Holy Spirit made her acquaintance and visited her daily. Her interactions with the Holy Spirit prompted her to leave home about 1230 and go to Magdeburg to join the Beguines, a group of lay Christians who lived in semi-monastic communities and vowed not to marry. Das fliessende Licht der Gottheit ["The Flowing Light of Godhead"], which became an inspiration for other mystics in the decades to follow. Her writing is interspersed with the occasional poem, such as the one above. Some have suggested that her vision of the three helped to inspire Dante's Divine Comedy. In Canto XXVIII of Purgatorio, there is a Matilda gathering flowers. This figure is usually identified as Matilda (1046-1114), a Grancontessa of Tuscany, who supported several popes, but a "Matilda" who lived much closer to Dante and was known for her religious visions might be a better identification. In 1270, she joined the Cistercian nuns at Helfta, and was respected by all. Some think she lived until the 1290s, but there are no definitive records of her after 1282. Henry of Nördlingen was an interesting character. We don't know when he was born, nor when he died, but we know that he was very active for many years in the "German mystic" circles. The British Museum holds a manuscript which contains 58 letters written by Henry between 1332 and 1351; in fact, they are considered the earliest collection of personal letters written in German. His life's goal—the only goal of which we know, based on the letters—was to guide and advise mystics, of which his mother was one. He wrote letters to, or visited, several mystics in order to encourage them. Among his correspondents were Christina Ebner, Margareta Ebner (no relation to Christina), Henry Suso, Johannes Tauler, and others. He translated the memoirs of the 13th century mystic Mechthilde of Magdeburg, and used it as an example to other mystics to write their revelations. He also sent them books on theology, such as the works of Thomas Aquinas. His activities and letters shed a great deal of light on the thread of mysticism running through 14th century German religious society. He was also a preacher in his own right; he was very popular, traveling to Avignon and Switzerland, where he was welcomed by the "Friends of God," a group inspired by the teachings of another German mystic, Meister Eckhart (c.1260 - 1328). He left them and preached in Alsace during the height of the Black Death there, then returned to Germany in 1350. His last known correspondence was with Christina Ebner in 1351; after that, we have no knowledge of the end of his life. Christina Ebner was born on Good Friday (26 March) 1277, to a well-off Nuremberg family. Her mother taught her to be very devout, and from the age of seven Christina asked to be allowed to become a nun. At the age of twelve she was granted her request, and her parents took her to the Dominican nuns of the Monastery of St. John the Baptist in Engelthal (near Nuremberg). After one year there, however, she was taken with an illness that recurred thrice per year for the next decade, and then frequently thereafter. Difficult for her, but during her illnesses she had visions, which she was encouraged to write down by her confessor, Father Conrad of Füssen. She consequently wrote a biography that recounts her whole life, and she kept writing right up until 1353 (she died 27 December 1355/6). Her first account was called Leben und Offenbarungen [Life and Revelations]. She also wrote a book that recounted mystical visions experienced by other nuns in her monastery, called Schwesternbuch [Book of Sisters], and later another book of revelations called Offenbarungen [Revelations]. In this last book, she also recorded her impressions and ideas on certain historical events, such as the 1348 riots in Nuremberg, an earthquake, and the conflict between the papacy and the Holy Roman Emperor Louis IV. Christina's fame drew several visitors to her, including Holy Roman Emperor Charles IV. Another was Henry of Nördlingen, priest, traveler, and spiritual advisor, who gave her a book by the mystic Mechthild of Magdeburg. In fact, Henry deserves his own entry, which he will get tomorrow. Speaking of iconoclasm (as we just were in the post on the halo in art), did the Middle Ages or the Church have a position on images not made by hand? 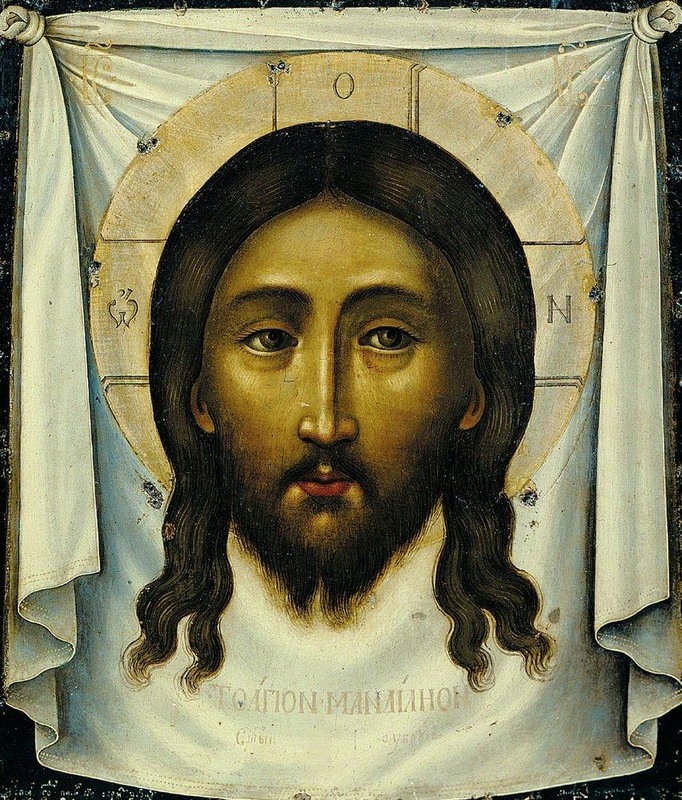 If images of the divine were blasphemous, how would one deal with Veronica's Veil, the cloth used by Veronica to wipe the face of Jesus while on his way to Golgotha? His likeness mysteriously appeared on the cloth. Was this not an icon, and proof that icons were acceptable to God? Authentic or not, it was the start of a trend of cloths that showed the face of Jesus without having been made by human agency. Icons such as this had a name, Acheiropoieta, "not made by hands" (Greek ἀχειροποίητα). Despite the "not made by hands" label, many items that fell into this category were made by human hands, so long as those hands were holy, or the subject was an acheiropoieton. Saint Luke was said to have painted a portrait of Mary when he visited her. If this image survived, it would be an acceptable icon. Also, human reproductions of Acheiropoieta were considered by some to be as sacred as the originals, and as acceptable in the face of the iconoclasm controversy. An eastern Church Council of 836 declares certain items to be legitimate Acheiropoieta: the Image of Edessa, a square of cloth containing the face of Jesus; an image in Lydda (now Israel) of the Virgin that appeared miraculously on a pillar in a church; another image of Mary in Lydda that appeared in another church. Unfortunately, there was no Church Council of 836, and the document is considered fraudulent. Acheiropoieta are usually considered to have miraculous properties. On the Island of Cyprus there is an Acheiropoietos Monastery, named so because of an Acheiropoieton that miraculously moved from Asia Minor in the 11th century to save itself from a Turkish invasion. *To the Middle Ages, this was proof that the world is composed of patterns and symbolism. To later historians, this suggests that "Veronica" was an ideal name made-up expressly for this anecdote. The picture here is medieval, although not from the Middle Ages. It's of the dome of Our Lady of Victory Church in Lackawanna, NY. It was taken and sent to me by someone who asked "Why is the halo triangular?" It turns out that there have been many ways over the centuries to express saintliness or godliness through the use of different styles of halo. "Halo" comes from the Greek ἅλως, which means the "shining disk" of the sun or moon. * There have been many representations of haloes in art throughout the whole of art history. Sometimes they are represented as rays shining out from the head of a special person. Often they are circular. The circle may be portrayed as a disk behind the saint's head, looking like a large dinner plate floating so that his or her head is perfectly centered in the circle. In the Renaissance (see the top image here), when realistic perspective became a goal in art, the halo was often shown as if it were a perfectly round and flat disc that was attached to the back of the head, so that at an angle you would see it as an elliptical hat (check out the fancy hats here). Later, it was fashionable to portray it as a simple lighted "hoop," as we see in this 15th-century painting. There were some special haloes, used in only certain circumstances. Members of the Holy Trinity could be seen with a halo that had three rays (or sets of three lines) extending from the head to the circumference. We see that in the diagram to the right. A halo made of stars was used only for the Blessed Virgin Mary (here is a sample, connecting her to the EU flag), because of the woman whose head was surrounded by 12 stars mentioned in the Book of Revelation who gives birth to the child who was to rule all nations. Which leaves the triangle. The triangle also represented the Trinity, but was used solely for depicting God the Father. This was perhaps because the triangle is the obvious symbol for the Trinity. It could be because God the Father rules in Heaven, and "heaven" or the area above the earth was sometimes represented symbolically as a triangle. Earth's symbol was a square, due to the four cardinal directions and the "four corners of the earth," and if you look from one horizon to straight up and then down to the far horizon, you have drawn a triangle with your eyes. So, the church in Lackawanna, NY, drew from some old symbolism for the depiction of God on the dome; clearly, it was not built by iconoclasts. *You can see examples of the meteorological phenomena that inspired the word here. Jean de Muris was mentioned in the post on Ars Nova as the author of Ars novæ musicæ [New technique of music]. He did more than that, however: he was also a mathematician and philosopher, an astronomer, a colleague of Philippe de Vitry, a lecturer at the Sorbonne. Born near Lisieux about 1300 (he died c. 1351), he studied at the University of Paris and spent a lot of his time there as well as at Evreux, Fontevrault and Mezières-en-Brenne. He wrote a few books—perhaps as many as five (we are not sure whether some were written by him, but similar style is a reason for ascribing some works to him). There are over 150 manuscripts of copies of works attributed to Muris. At one point, a work that criticized the Ars Nova was considered to have been written by him, but later it was determined that someone else wrote it. Muris certainly approved of the new style in his works. One of these, the Quæstiones super partes musicæ ["Questions on the parts of music"], can be read (in Latin) here. This embodies the Ars nova, which brought formal music out of the Church and made it complex, expressive, and secular. 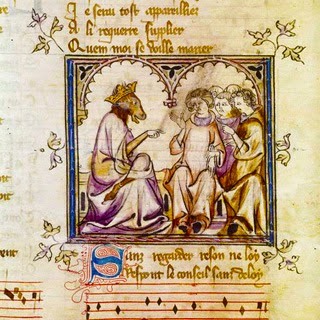 Beginning in the early 1300s there was a change in musical style, an evolution from monophony (a single melody) to polyphony, in which two or more lines of melody intermingled. The result was to give music a richer, more expressive sound. The Church didn't like it. Pope John XXII rejected it (as he tried to reject elections of which he did not approve). The sacred monophonic chant of the Church was being mixed with secular tunes. Music was becoming "fancy" and "frivolous" in ways that did not suit the pope. The new style caught on, however, and there was no turning back. Two books describing the new technique helped to spread the new ideas. They were Ars novæ musicæ [New technique of music] by Jean de Muris c. 1320, and Ars nova notandi [New technique of musical notation] by Philippe de Vitry in about 1322. Because of these titles, 20th century historians refer to this style and period of time in music (the 14th century) as the Ars Nova. This new style developed at the same time in France and Italy. 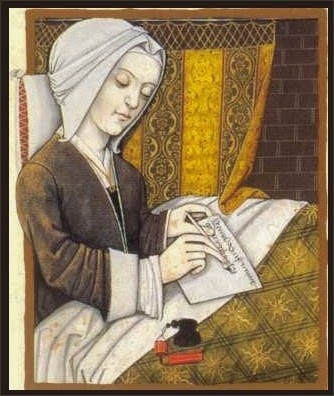 In France, one of its greatest exemplars was the poet Guillaume de Machaut. A sample of his musical composition is found in this post. Among the new forms of non-sacred music given to us by the Ars Nova are the Madrigal, usually a song of love for two voices, and the Ballad, a story with a non-religious theme which was meant to be sung in public. 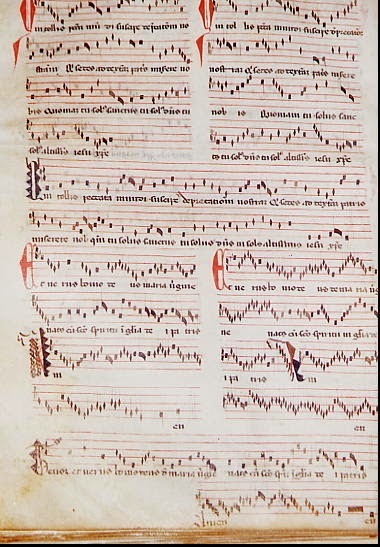 The music in the manuscript of the Roman de Fauvel is an example of Ars nova. 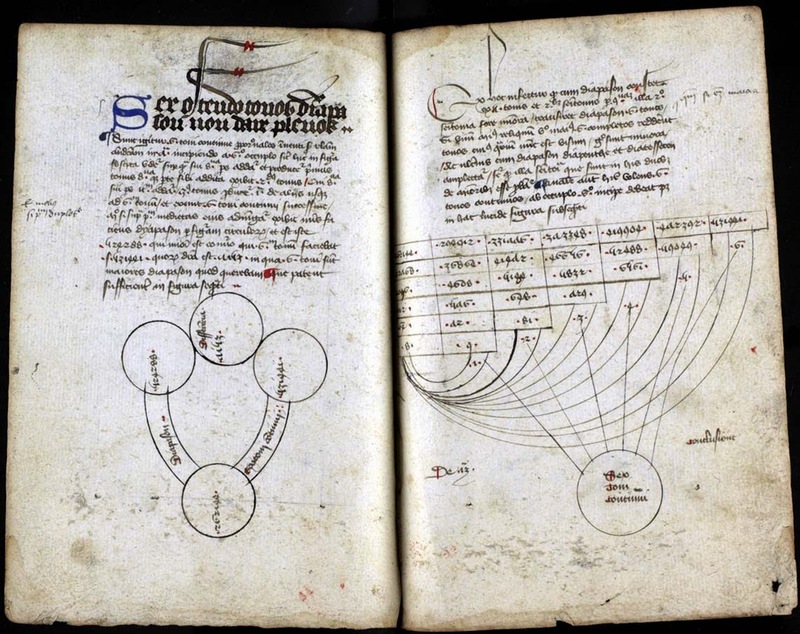 A 14th century manuscript is an amazing example of a "multi-media" piece of fiction. The story? It's about a horse ... a horse that becomes a politician. The Roman de Fauvel ["Story of Fauvel"] is dated to as early as 1310, although the author is unknown. It is an allegory, in which a fawn-colored (French fauve) horse decides he is unhappy with the stable and moves himself into the largest room in the nearby house, altering it to suit his needs (like adding a crib for fresh hay). Fortuna (Fate) makes him the head of the house, and leaders both secular and religious come to listen to him, increasing his fame. Ultimately, Fauvel marries Lady Vainglory and begins a life of begetting corrupt leaders that will usher in the end times. The original story was expanded by Chaillous de Pesstain*, who added musical notations to it—in fact, 169 snippets of musical notation to accompany the story. This particular copy is found in the Bibliotheque Nationale in France as manuscript BN fr. 146 (which you can see online here). The Roman de Fauvel gave birth to a modern idiom. To "curry" is to groom a horse, and the leaders in the story would curry Fauvel in order to ingratiate themselves to him. "To curry Fauvel" became a saying to indicate trying to please someone so that they look kindly upon you. After the 17th century, this was misunderstood in English as "to curry favor," to try to get a favor from someone by flattery. *And that's about the sum total of all we know about him. He may have been just the scribe of that particular manuscript. He was the son of King Cnut, and his royal name was Cnut II (of England) or Cnut III (of Denmark), but he is more usually known to us as Harthacnut. His parentage ascent to the throne has been mentioned before, but today we are going to talk about the cause of his death...or the causes of his death. Harthacnut died on 8 June 1042, when he was only 24 years old. He was attending a wedding for one of his former stallers, Tovi the Proud. (A staller was a Norse official, a constable or standard-bearer.) Tovi was getting married for the second time, to Gytha, daughter of the powerful Osgod Clapa. The typical interpretation given to this by historians is that he died from a stroke due to an excess of alcohol. Others think it was more likely a heart attack. There is another theory, one which draws on a circumstance from long before the wedding feast. Harthacnut, though young, was the center of a lot of political machinations. A history written at the order of his mother, Emma, says that in 1041 he sent to Normandy for his brother Edward so that they could rule together. 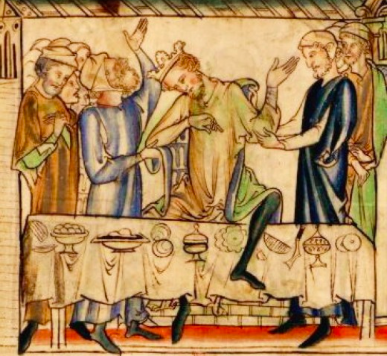 One version of the Anglo-Saxon Chronicle says Edward was actually sworn in. Edward had no heir—not even a wife—and his naming as a king seems strange, considering Harthacnut was so young. Did Harthacnut have a known illness? One that was making him clearly unsuitable to be king? Is that why Edward was summoned and sworn in? One historian* hypothesizes something like tuberculosis that was causing him to deteriorate in a way clear to those around him, suggesting that they secure an heir to the throne without relying on him to survive long enough to produce one himself. *Howard, Ian, Harold II: a Throne-Worthy King. Essay included in King Harold II and the Bayeux Tapestry (2005). Boydell Press, ISBN 1843831244. Gilbert de Clare, 7th Earl of Gloucester (1243 - 1295), was mentioned in the post on the Battle of Evesham, switching support from the treasonous Simon de Montfort to King Henry III. Though very young, he had already managed some significant accomplishments. His father died in 1262, when Gilbert was still in his teens, and so Gilbert was made a ward of Humphrey de Bohun, the 2nd Earl of Hereford (whose son would also have experience with a traitor), but came into his own a year later. So it was that, in spring of 1264 (as part of the uprising against King Henry), he captured Canterbury and attacked the Jews. He may have been emulating Simon de Montfort, who had expelled Jews from Leicester in 1231 (one year before Henry established the Domus Conversorum to give English Jews an option for co-existence). The older Montfort's parents had been extremely hostile to Jews in the past. Clare might have been operating simply because he could, and wanted to impress Montfort, who was the focal point of the barons' uprising against Henry and looked like he would be the next king. Eventually, however, Clare's sympathies shifted back to Prince Edward in 1265, after Edward escaped his guardians and began to rally supporters against the rebellious barons. Years later, when Henry died, Clare swiftly and openly declared loyalty to the new King Edward I. Clare was named Guardian of England whenever Edward was out of the country. He died on 7 December 1295 and was buried in Tewksbury Abbey. A stained glass window in the abbey represents him...or his son Gilbert, the 8th Earl...or his grandfather Gilbert, the 5th Earl. Evesham Abbey had existed for about five and a half centuries by the time Henry III was captured by Simon de Montfort at the Battle of Lewes in 1264. Montfort was at the head of a group of barons who felt Henry was too irresponsible as a monarch, but as Montfort introduced reforms that gave Parliamentary representation to the lower classes, the nobles started to turn on him. Evesham would be the setting for Montfort's defeat and Henry's return to power. In 1265, Henry's son Edward was released from captivity "on parole." Those loyal to Henry began to focus on helping Edward as Montfort's popularity continued to wane after the powerful Earl of Gloucester, Gilbert de Clare, stopped supporting him. Also, de Montfort made an alliance of convenience with Llywelyn ap Gruffyd, Prince of Wales—mentioned here as "Llewelyn the Last"—which proved an unpopular move with his remaining English supporters. Clare joined forces with Prince Edward, and together they moved to occupy Worcester. Montfort gathered his army and marched to Wales to add Llewelyn's troops. Unfortunately, while Montfort was in Wales, Edward and Clare expanded the territory over which they had control. 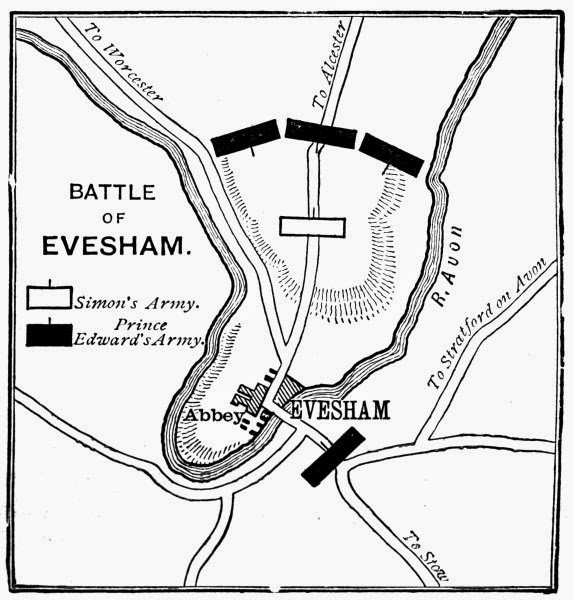 In early August, the two armies met near Evesham Abbey, with Edward's larger force trapping Montfort's in a loop of the River Avon and blocking his only chance of escape. Montfort was, in fact, keeping Henry with him for security. Henry came close to being killed in the cross-fighting, but the battle ended quickly once Simon de Montfort was killed and mutilated by Edward's forces. His troops were chased and cut down without mercy. Henry was restored to the throne and held a Parliament the following month in which those who turned on him were disinherited. Ultimately, after some more military engagements between the two sides, Henry's Dictum of Kenilworth offered the nobles a chance to regain their former estates via payments to the Crown. Years later, Edward would become King Edward I. The monks of Lewes Priory ran a Hospital of St. Nicholas in the Middle Ages, now long gone. In the early 1990s, during an excavation of the site, a number of skeletons were unearthed. One of them, "Skeleton 180," showed evidence of several sword blows to the skull. The proximity to the site of the Battle of Lewes, and the fact that hastily dug mass graves were a common after-effect of large battles, led to the conclusion that he was killed in 1264 while either attacking or defending King Henry III. The skull was sent to the University of Edinburgh for radiocarbon dating, and the results were surprising: it was much older than 1264. In fact, it dated to within a generation (before or after) of the Norman Conquest. The picture it suggests of the events around 1066—and this is the only skeletal remains we have even remotely connected to the fighting that was part of the Norman Conquest—adds a little more detail to our understanding of what happened when William of Normandy decided to assert his claim to the throne of England. As we know, lifestyle leaves an imprint on the body that can be analyzed by forensic science. 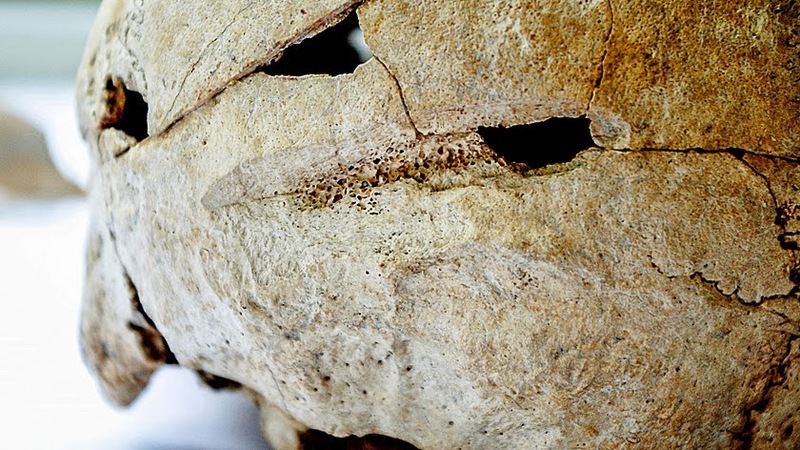 Skeleton 180 provides a are glimpse into a life from the 11th century. King John wasn't the only English monarch who had his barons turn against him (forcing him to sign the Magna Carta). Another constitutional crisis arose a mere 50 years later during the reign of Henry III. Henry lived a lavish lifestyle that demanded lots of money, which he demanded from increased taxation. He also got involved in issues that the English barons felt were not necessary to England's interests. 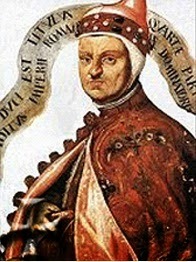 For instance, Henry "bought" the title of "King of Sicily" from Pope Innocent IV by funding a war with the rulers of Sicily at that time, the Hohenstaufens. Henry wanted the title for his second son, Edmund. When funding for the war ran out, and victory was no longer in sight, Innocent reneged on the deal and gave the title to Charles of Anjou. The barons, led by Simon de Montfort, tried to control Henry with, among other things, the 1258 Provisions of Oxford, reducing his powers. Henry got a dispensation from the pope in 1261 that released him (in his eyes) from the Provisions, and the barons and the forces loyal to Henry started arming for civil war. A turning point came on 14 May 1264, at the Battle of Lewes. 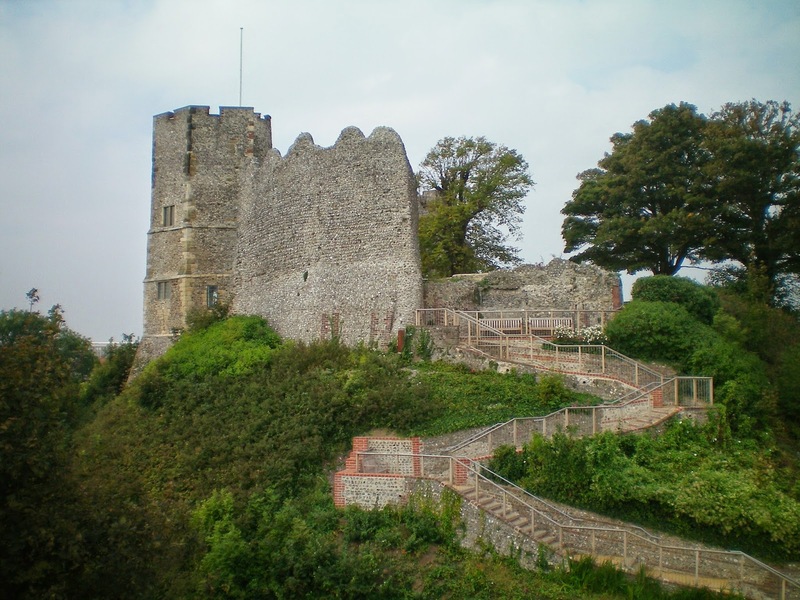 Henry was ensconced in Lewes Castle in Sussex, but left it to attack de Montfort's forces. Part of Henry's army was under his command, and part under that of Prince Edward (later King Edward I). Edward's cavalry drove off the attackers, but Edward pursued them, leaving his father outnumbered by the remaining de Montfort men. Captured, Henry was forced to sign an agreement called the Mise* of Lewes, giving control of government over to Simon de Montfort. Constitutional historians do not recognize de Montfort as a king, even though he was controlling the government for about a year. His support faded, and Prince Edward raised an army a year later and defeated de Montfort at the Battle of Evesham, returning power to Henry. *"Mise" is a rarely used word from French meaning "settlement." Not historical coincidence; recent coincidence. In the post on Vikings in Ireland, just a few days ago, Olaf III Guthfrithsson was mentioned; he had been King of Dublin from 934 until 941, and also had brief periods of rule in parts of England. One day after that post, imagine my surprise when I see an article with the title "Skeleton Discovered May Be Viking King Olaf Guthfrithsson"! An archaeological excavation conducted in East Lothian (Scotland) in 2005 turned up the remains of a young adult male surrounded by artifacts that suggest he was very important. One of those artifacts is a belt whose clasp is clearly of Viking design. Accurate identification of the skeleton is probably not possible, suggesting that the headline of the article was designed to generate more interest than the actual find deserves. 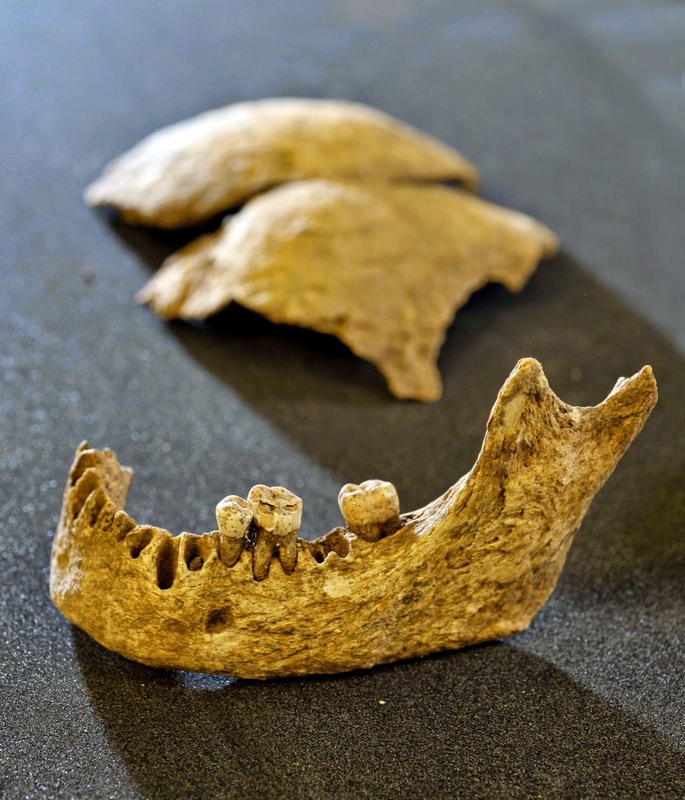 Although modern forensic science can determine a lot from medieval bones (also coincidentally discussed in this blog in a recent post), the best opportunity for identification of a specific person is genetic comparison of DNA in the remains with known modern descendants. In this case, we have no descendants of Olaf from whom we can get DNA. "This is a fascinating discovery and it’s tantalising that there has been the suggestion that this might be the body of a 10th century Irish Viking king. Scotland and Ireland’s archaeological communities enjoy a close working partnership, and this find and subsequent research is of particular interest to both, further emphasising the myriad ways in which the two countries’ histories are entwined."